Located in Montignac (Dordogne), DETAM PISCINE is at your service for any pool construction project. Make your pool construction dream come true thanks to our know-how. A team of specialists is at your entire service to make your project a reality. With 14 years of experience, we will successfully install your traditional swimming pool. We operate in Montignac, Montélimar, Brive-la-Gaillarde, Sarlat-la-Canéda and the surrounding areas, and can advise you on the choice of materials and pool design. Providing services to both individuals and professionals, we remain attentive to all your needs. If you are in the lodging industry, we can embellish your garden (camping, gîte, hotel, private residence...). We have all the required skills and equipment to make your dream come true. We also sell various accessories to equip your swimming pools. Find everything you need to keep your installations in good condition. We guarantee a waterproof and high-quality pool. Drawing on 14 years of experience in the design and construction of commercial and residential swimming pools and spas, at Detam Entreprise Piscine, we have the expertise to manage your entire swimming pool construction project, from initial enquiry to reducing water consumption and filter run times. We operate across Dordogne, Montignac, Sarlat, Terrasson and Brive and Périgord Noir. 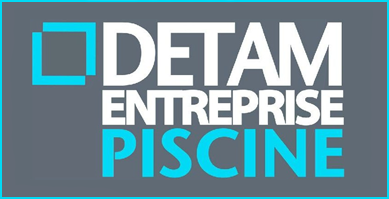 As a swimming pool design and construction specialist, Detam Entreprise Piscine offers bespoke pool services to both individuals and businesses, including hotels and cottages. Entrust the construction of your pool to DETAM PISCINE. As waterproofing specialists, we will give you full satisfaction.